Producer Price Index rises most in six years. The Producer Price Index for final demand – which tracks prices received for goods, services, and construction from the perspective of the seller, as opposed to a measure like CPI which tracks prices paid from the perspective of the buyer – jumped 0.44% seasonally adjusted in November from October, after having risen 0.44% in October and also 0.44% in September, the Bureau of Labor Statistics reported today. After those three sharp monthly increases in a row, the index has now risen 3.1% year-over-year (not seasonally adjusted), the fastest increase since January 2012. In the chart above, note the impact of the collapse of energy prices in 2015 and early 2016, which was just a temporary blip on the longer-term inflation scale. The PPI for final demand, finished goods, spiked 1.4% from October and is now up 4.3% year-over year, the fastest rise since December 2011. Gasoline prices jumped 15.8% in November, and that had something to do with it. But this time, is wasn’t just energy: The PPI for final demand of consumer goods less the volatile categories of foods and energy also rose 0.4% from October! This index is now up 2.2% year-over-year. The PPI for final demand of services rose 0.2% monthly and is up 2.4% year-over-year. The PPI for final demand of transportation and warehousing services, rose 3.5% year-over-year, with passenger transportation jumping 4.4%. 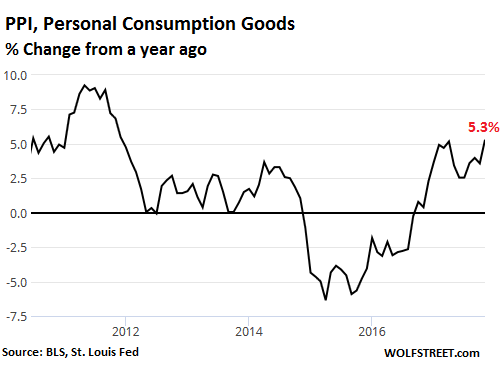 A special word about the PPI for Personal Consumption Goods (finished consumer goods), something consumers might want to keep an eye on: it spiked 1.7% from October and is now up 5.3% year over year. The changes of prices that producers receive for their goods and services don’t always convert in lockstep to changes in prices that consumers pay. But they precede them and form the basis for them. In terms of consumer prices, the PPI points at inflation pressures beneath the surface. Consumer price inflation, as measured by the Consumer Price Index, lags the price pressures seen further up the pipeline [update, Dec 13: CPI rose 2.2% in November]. At this point, these pressures are not a sign of some kind of run-away inflation. But they’re a sign among many others that inflation is ticking up, that pressures are building further up in the pipeline, and that some temporary factors that had eased inflation down a smidgen have started to fade. The Fed looks at all kinds of data for its rate decision, glimpses of which can be seen in the minutes. Its primary inflation measure is the core PCE price index, but like the CPI, it too is subject to price pressures building up in the pipeline, which is what the PPI shows. In other words, there is nothing in this report to discourage the Fed from continuing, as it likes to say, to “gradually” remove “accommodation” from the financial markets. ← Peak Bitcoin Media-Mania Yet? Fed policy in 2018 will largely depend on stock market. Strong stocks mean more rate hikes and asset sales. Sharp stock correction could derail any further hikes. 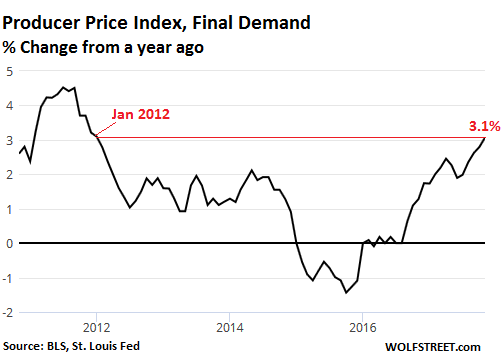 The Fed has a couple (meaningless) explicitly stated mandates but their one true (and only recently stated) mandate is price instability – that is to say: job #1 at the Fed is to cause inflation and allow a stealth default of debt. It’s interesting to read, each day, new articles and comments regarding anticipated central bank tightening. All Draghi has done is imply he may one day, far off in some unspecified future, start to taper purchases – and somehow that statement is taken as tightening. Five years from now central banks will still be inflating away the currencies and all of this talk of tightening will be forgotten noise. If the Fed was looking for inflation they could have asked me about it. I live and work in Seattle. I earn above average (and median) pay for the area but I now live in a van because housing is out of reach – I can’t afford it. I’m not alone, there are plenty more like me camping out in the Walmart parking lot. We are middle income earners who cannot afford housing – now a luxury item reserved for wealthy investors. Between fed and ECB taper a trillion $ is SUPPOSED to be eliminated from capital markets and fed is reducing balance sheet and higher short rates Feeds money into banks direct from main street pockets? Inflation is transitory! 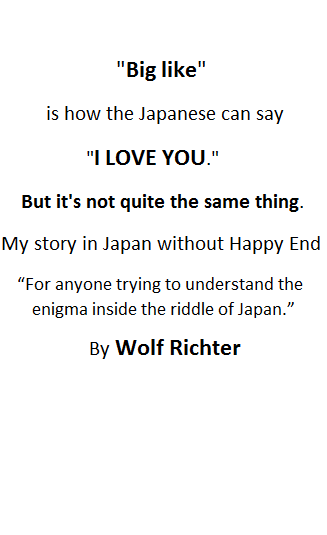 – Agree. The FED indeed gets more ammo for a rate hike because the 3-month T-bill has risen above 1.25%. Condolences on losing your mayor. I read he dropped dead in a supermarket, probably heart failure. I feel that way every week. – Did you never hear of the reduced rainfall inwestern parts of the US since the year say 2000 ? think: rising food prices. -You don’t want those poor poor produces to make a profit ? I want everybody in business to sell a good product and service and to make a profit. My comment was related to how the govt goes out of its way to hide the inflation which is apparent to most of us daily. Meanwhile, the yield curve has been flattening as opposed to steepening. But … but … but The ECB absolutely NEEDS the Fed to stay with the program Bernanke designed for everyone to print money and manage rates so that all currencies maintained parity, stocks zoomed, and rates stayed low. THIS will never do! Resolved … inflation IS NOT enough of a reason to raise rates anymore. There’s some other reason needed. It’s a big one, too. Way bigger. Raising rates before then will mean doom. It’s OK to talk about rate increases but, please, get real about actually raising them. Time for the talking heads to get in front of this by getting on financial TV ASAP. Right thinking Fed members included. Especially. Hint … inflation wasn’t supposed to actually happen when QE was first thought up. Replacing interest income from capital accumulation with wealth effect income from asset inflation, accompanied by rate management, should have made inflation nearly impossible. Deflation was the only option this plan provided. No realistic interest income options available cut textbook defined macro economic income in half or more. Prices fell to match income. Waiting for inflation would be like Waiting for Godot. The plan failed. Oops. Now, or soon, it ill be a scramble to amend history so that all fingers point somewhere except Bernanke, Draghi, Kuroda, and others. If we enter deflation debtors are screwed because their debts grow larger in real terms. Debtors need inflation. Guess who the biggest debtor is? That’s why the government is both mystified and disappointed that the largest stimulus in US history hasn’t produced enough to even begin to bail it out of its 22 trillion hole. Interest on excess reserves payments increase to the banks and main street gets hit with a triple whammy? Spider sense is go! Not knowing for sure who the FED works for, and when they decide to privatize gains. We can be sure they also intend on socializing any of their losses as well. The FED has never failed to help their employers accomplish their goals, this doesn’t exclude using misleading lip service. In this case, they just shrug their shoulders and act like they made an error. We all know the FED doesn’t make mistakes accidentally on purpose and people don’t lose their jobs, family and life savings as a result, right? money market funds will go into the stock market. Ergo, the synthetic construction of the wealth effect. Three consecutive months when the increase was exactly 0.44%? Really? Has calculation of the PPI been outsourced to those wonderful people in China who generate equally consistent numbers for their government? Thanks for the clarification, however it is still curious that three consecutive months were all within a few basis points of each other. Anyone want to wager a bitcoin that the December number will not be .44% rounded to the second decimal? What odds will you offer? If you look at the month-to-month chart (link below), you will see that a three-month same-rate period only happened once before since 2010. The charts looks like rotten shark teeth, and then the last shark tooth just broke off at the top or something. But every tooth is unique in that chart. So it all fits – this is data doing its own thing. It’s not pretty and it’s not regular in any way. It’s “noisy” as we say. To get to the month-to-month percentage change, click on “Edit Graph.” At “Units” select “percent change,” and there you go. And let’s not forget the tax cut proposal that Sec Treasury Mnuchin presented on one page,with so little detail a former Sec of the Treasury says it reminds him of a high school student fudging up an essay overnight. Stimulative tax cuts are usually reserved for a deflationary situation, not one with these charts. And yes the Fed has is watching. All professionals (and amateurs) have scoffed at the amazing key variable built into the equation: a 2.9 percent growth in GDP each year for the NEXT TEN YEARS. The former Sec (Summers?) likened this to his golf drive improving if he could golf in reduced gravity. So far everyone who is not actually a political flack has panned this silliness. There is also the number 2.9. Note the 9. We see that number a lot don’t we? In prices. $9.99, $19.99, $39.99, $49.99 etc. We focus on the big columns. not the cents. Here it works with the GDP prediction. Essentially the same number is made to sound more reasonable. This love of the number 9 has made its way into official stats before, from the CCP. For getting on to ten years, China always announced the same growth number: Seven percent. Gradually this unvarying 7, 7, 7, even through the recession, made pundits skeptical. And why a round number? That’s OK for a target, but as the result? So the CCP decided to face reality. In their first attempt they reduced the 7% to a much more realistic 6.9 %. I’m getting so fed up with my typos (the Fed has is watching) I think I’d better take the advice of lady friend editor and read aloud to self instead of repeat scanning. Tax cuts don’t cause inflation. The resulting deficits do. There lies the difference. Personally I think “demand management” is horrible government policy that should be completely abandoned. Tax reform should be pursued on a broad scale – but the right tax policies remain correct no matter what part of the economic cycle you’re in. Lest this sound like a defense of the current tax cut proposals, it ain’t. Cutting taxes without corresponding spending cuts, which makes the deficit bigger and inflationary pressures worse – is stupid. Stupid regardless of what the economy is doing. the current credit card offer i received from an unnamed big bank of america somewhere will give me 0% for 18 months for 3 points. quite a change from a few months ago. being deductible, and they “finance” them, i might have me a lending counterparty. Bankers believe their sugar comes from the short end and inverted yield curve is banker speak for victory. They will keep raising until stocks stop rising. That seems clear. Whether they continue after that is a guess. I think the Fed wants to see a decent market drop. Because the Fed’s concern is to keep wage inflation low. If interest rate is kept too low sooner or later it will feed into wages, but the 0.01% does not want that. Bingo, anyone watching the fed for at least 2 business cycles can see this is the case. Our (((masters))) are allergic to prosperity for anyone but themselves. Because its creating wealth inequality which will lead to revolution. OK you say serious so I’m not being sarcastic: the answer is roughly the same one the patent office gives for refusing to examine perpetual motion machines: they would violate fundamental laws of physics. They would produce something from nothing. The magic of credit (borrowing from the future) eventually runs out. This is why QE can’t go on forever. Moreover, nothing does more to diminish the quality of life and real prosperity of ordinary people than the property asset mega-bubbles which have been blown. Not much sense in being employed, earning a very little more, but seeing rents rise way beyond reach. The central bank policies of the past eight years have created huge asset bubbles all around. Asset bubbles are leveraged. That means these assets are collateral for debt. When leveraged asset bubbles implode, and asset prices sink or disappear, they take down the leveraged financial system. But the Fed is in charge of preserving the financial system. To protect it, they want to tamp down on assets bubbles, which is ironic because their policies caused the asset bubbles. If 2017 is the year you got hacked 2018 might be the year inflation and debt will cause … what? A few Zombie unicorns might actually die for real. The Fed might actually pull four rate hikes in single year. Bitcoins and it’s daughters might rise and fall, there might be even more cryptocurrencies scams. While the Eurozone and the US continue their war on cash other countries are likely to keep being happy to keep accepting euros and US dollars in cash. You will be hacked, again. Online security may be almost sure looking as if it was done by companies with pointy haired bosses. Students loans will be likely to be even a bigger problem. It was a far different time in the 1970’s. Comparing white stag and red stagflation is like apples and oranges? My store (big blue) is too busy making everyday happen for 70 home bound shoppers who need a associate to make the shopping decisions for them, to even check out the few revellers who have any remaining income to venture into the Saturnalia fraud? Panhandling signs buck a piece quality Chinese cardboard!